While this series started to come out in Jonasson’s native Iceland in 2015, the books have only now started to make their way stateside, via the UK. 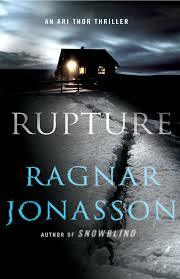 Rupture, which Jonasson wrote in 2016, will be published here in January. It’s the third in his “Dark Iceland” series which began with the sensational Snowblind. Let me tell you, whatever publishing path this author took to get here is definitely worth the wait, as he is a phenomenal writer.